With her memories of Kara's secret identity erased, Alex finds herself increasingly conflicted about her feelings about Supergirl in the wake of the DEO's new mission, as she deals with a new street drug that makes people violent and gives them temporary superpowers. Meanwhile, Kara travels with Nia to her hometown to celebrate their annual Harvest Festival, only to discover the Children of Liberty are planning to disrupt the festivities. How did the drugged-out frat boys get to their party? Didn't anybody notice them during the several hours between when they took their drugs (there was daylight) and when they got to the party, when it was dark? Granting that the Children of Liberty are kind of stupid, you'd expect them to not be wearing their masks like sun visors while walking around a town built on the ideals of human/alien integration, particularly now that their leader has been arrested on terrorism charges. Why does Parthas hold their Harvest Festival in the middle of winter? Usually those are held in the fall. Jesse Rath seems to be delivering his performance while on cold-medication this week. Maeve says that Parathas has ways of dealing with anti-alien bigots who cause trouble in public. These protections don't seem to be evident when the Children of Liberty attack her mother's memorial. Alex says that Supergirl's word that that the alien attacking Bobbi Miller was acting in self defense is not good enough and that there is no evidence the Children of Liberty attacked a peaceful memorial... apart from the fact that there are idiots in gold masks running around trying to kill everyone who is dressed for a memorial service? Why is Alex's relationship with J'onn unaffected by her memory wipe? If removing the knowledge that Kara is an alien from her mind caused Alex to become unsympathetic towards aliens, shouldn't that have altered her relationship with J'onn in her mind if she started thinking about it too much? The cinematography and lighting of the dream sequences is good. Parthas is the Irish word for Paradise. Brainiac-5 says that the bruises left by the touch of a Truth Seeker are not really bruises but the remnants of toxins pulled from the body. Brainiac-5 says that the party drugs were irradiated with 15-to-the-19th power hertz worth of gamma rays. Kara: First commandment of road trips? (dramatic voice) Thou shalt defer to the driver's choice of music! Brainiac-5: I discovered the species we apprehended last night. Brainiac-5: No. Not just human. Frat boys! Maeve: (on the Children of Liberty) When you have something good, there's always going to be people who want to tear it down. Alex: How did you learn to speak dude-bro? Brainiac-5: Same way they did. The movies. Nia's Mother: My element was water. Yours is fire. And your fire will make you far more powerful than I ever was. It was your destiny to be my daughter. To be Dreamer. Life put yout hrough many trials just to be who you are. It made you strong. That strength will serve you well as a hero. Nia: (sobbing) I appreciate your support, but this isn't something you can understand. I have alien powers. My sister doesn't. And now, she hates me. Nia: Why are you pulling over? Nia: Kara? What are you doing? Kara: I do understand! Probably better than anyone! Kara: I am Supergirl. Very few people know my true identity because it's not safe for them to. But I'm telling you... because I think it will help you. And I don't think it will harm you. You, too, are a hero. I was the sister with powers. And I watched Alex pay the price for it so many ways. Most of the time she handled it with grace...but, I'll tell you there were some times when it got ugly. When we were younger... and even now. (pauses) But I have faith that the love between two sisters will prevail in the end. I have to believe that. I just need you to know now that you are not alone. You have a family. You have me. Nia's dialogue about transitioning during the car ride with Kara sounds like the kind of speech people make on TV shows rather than real words an actual person would say. The Kaznian Supergirl clone develops a nose-bleed and passes out in the middle of training. The attempts to revive the Kaznian Supergirl with a defibrillator send a bolt of purple lightning out of her body and around the world. The energy rocks a trailer in National City, where it infuses a hand-full of pills in the mobile home of two drug dealers named Jerry and Kev. Jerry has a studious younger sister named Bobbi. Alex, Kara, Nia, Brainiac-5, J'onn, James and Lena all meet for a game night. The game they are playing is Exploding Kittens. Nia is from a small town north of National City called Parthas. It is a community where humans and aliens have been living in peace for decades. James and Lena disagree on the greatest invention in human history. She says it's the electric light. He says it's the printing press. Alex can no longer remember what Kara's favorite movie is. She guesses that it was Center Stage (Kara apparently broke three lamps one summer learning how to do the red shoe dance.) and then guesses Terminator 2, which is Alex's favorite movie. Alex and Brainy are called away to deal with aliens fighting at NCU. Alex insists on being addressed as Director Danvers by Supergirl. Kara's favorite movie is The Wizard of Oz. Eliza Danvers showed it to her, thinking Kara could relate to the story of a young girl being sent off to a faraway land. Kara thinks Alex doesn't remember this because it relates to Kara being an alien. One of James' reporters, Mackenzie, says she found evidence of a secret budget at L-Corp that has something to do with genetic testing. James agrees to let her investigate it, but asks to see what she discovers first. Kara offers to drive Nia to the harvest festival in her town, after Nia's flight is cancelled. The hostile aliens the DEO apprehended at NCU change back to normal the next day. Nia's mother migrated to Earth from Naltor when she was 18. The day before she fled the planet, she dreamed of a farmhouse where she would meet her true love and a series of random numbers. Using the random numbers as navigational instructions took her to Earth and the town of Parthas, where she was taken in my a family of farmers and fell in love with their son - Nia's dad. Nia says her parents were supportive of her transitioning. Nia hasn't told her family about her prophetic dreams yet and asks Kara to keep that a secret. Alex is unable to get the two frat boys to name their drug dealer so she can trace the drugs. Nia has a dream where she is in a field, watching her mother get ready for bed while sitting at a dresser covered in cobwebs. She crumbles into dust after drinking some black liquid and a crow flies from the ashes. Nia's mom grows fantastic radishes. Maeve inherited her mom's gift for gardening, but she focuses her talents on orchids. She claims to have all 30.000 types of orchids memorized. As Nia is looking at her mother's desk, she sees a glass full of black liquid, which she drops after a flashback to her dream. It turns out the glass is full of ink, which Nia's mom is using to teach Maeve Japanese ink wash painting. Nia has always wanted to be a journalist. She read Cat Grant's book on news writing 14 times. Maeve lives down the street from her parents and owns an art studio. Nia's mother makes paintings of her dreams of the future. Nia's mother says that she dreamed that her daughter would inherit her gift. Only one daughter per generation of a Naltorian family inherits the gift of prophecy. The gift is passed down maternal lines. Some women are cursed with future blindness, however, and in their case the gift skips a generation. Two more people take what Brainy dubs "the rage drug". He determines, based on the response to a video that was posted on-line of the frat boy attacks, that people are now seeking out the drug dealers intentionally to try the drug out. Maeve has been studying dreams and dream-interpretation her whole life. He old bedroom is full of books on understanding dreams. Kara agrees to interview Maeve so that Nia can talk to her mother alone about her dreams. Alex asks J'onn to scan her mind and make sure nothing is wrong. J'onn says that his mind-wipe of Alex should be undetectable but he's afraid that Alex being exposed to the Truth Seeker may have left the psychic equivalent of irritated skin, letting her know something is wrong without any idea what. He elects to give her a placebo and hope that will allow her to heal herself. J'onn suggests that Alex's unease may come from her needing a partner in the field - a good cop to her bad cop. This leads Alex so ask Brainy how his acting skills are. Maeve says that her grandmother was a superhero on Naltor who used her powers in the same way as Supergirl. She says she wants to use her powers the same way once she gets then. Kara spots two of the Children of Liberty with one of their alien sniffing dogs walking around Parthas. Maeve isn't afraid of the Children Of Liberty, saying that anti-alien bigots have been trying to disrupt the town harvest festival for years and that they have their own way of dealing with them. Brainiac-5 is able to get the names of Kev and Jerry out of the frat boys after being tossed in a cell with them and pretending to be another stoner frat boy. According to Nia's mom, there is no way for a Dreamer to refuse her gifts or transfer them to another. Nia's mother is bitten by a spider and starts dying. As she does so, Nia is suddenly in her mother's last dream. Nia has a dream where she is having dinner at a table in the middle of a field with her sister. Her sister knocks over a goblet of wine, which changes into a swarm of spiders and she is attacked by a murder of crows. Lena wants to train with James to do better at trivia games at game night. James decides to wait on asking Lena about the L-Corps budget information he discovered. Jerry and Kev travel to Parthas to meet a client who wants to pay them $10,000 for rage pills. The clients turn out to be Children of Liberty, who beat them up and take their drugs, intending to disrupt the Harvest Festival. Brainy is able to track Jerry and Kev through the registration of their mobile home. It used to belong to Mrs. Veronica "Roni" Miller. The title was passed to Roberta Miller - her daughter, younger sister of Jerry Miller. Bobbi takes the mobile home and the last of the rage pills and goes to Parthas chasing after the Children of Liberty. Nia's father gives her a box. He says that he had a dream the night before of his wife saying that the contents of the box were for Nia. Nia realizes her vision was a warning of the Children of Liberty attack. She saves Maeve from being trampled as a raging Child of Liberty breaks through the barn wall with an axe. Kara uses her heat vision to stop Alex from shooting an alien who is trying to protect himself from the enraged Bobbi Miller. Alex says that Supergirl's word is no longer good enough for her and that there is no evidence the Children of Liberty attacked a peaceful memorial. Alex says that she can't believe that Supergirl knows what it is like to be vulnerable. Maeve is embittered that Nia inherited their mother's power. She does not believe that Nia was trying to find a way to transfer the power to her over the past few months and that she spent the last few months laughing at her panic over being future-blind. She also says that Nia is not a real woman. 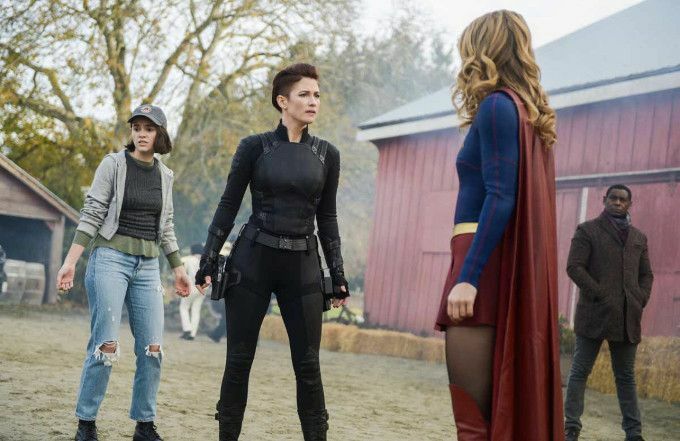 Kara reveals her secret identity to Nia, after Nia says there is no way she can know what it is to have a power her sister doesn't and to have lied about it. James says he looked at Mackenzie's sources and that everything at L-Corp is a-ok. It is suggested that James is lying and still hasn't confronted Lena on what he learned. Nia opens the box her father gave her. It contains a superhero costume. J'onn says that Kara was Alex's first exposure to an alien during her formative years and that relationship shaped her empathy for the aliens that she met years later. This is why Alex's current attitude now mirrors the DEO party line. The Kaznian army officer in charge of their Supergirl makes a phone call and says there is a problem and he needs to reach someone in America. Nia's mother dies to give her more angst about inheriting the powers her sister always wanted. Everything that is being done to Alex is being done only to give Kara angst about her trying to protect herself and to force her bonding with Nia over what it is to be the sister with powers you never asked for trying to protect your sister by lying to her. Perhaps not the worst episode of Supergirl ever but definitely one of the most illogical and painful to sit through. The script definitely needed more work as the dialogue is largely terrible and the supporting characters are flat. There's no resolution to the subplot involving Bobbi Miller and her drug dealer brother. Heck, the only reason Bobbi is even in the story is because some innocent girl has to do something stupid so that Alex can side with her over the aliens just trying to defend themselves to fuel. The actors do their best (with the exception of Jesse Rath, who seems to be phoning it in) but there's only so much they can do. All in all, this is a bad place to break for a three week hiatus.